The Baths of Agrippa (Thermae Agrippae) were a structure of ancient Rome, built by Marcus Vipsanius Agrippa, the first of the great thermae constructed in the city. In their first form, constructed at the same time as the Pantheon and on axis with it, as a balaneion (βαλανεῖον), they were apparently a hot-air bath with a cold plunge, not unlike a sauna. With the completion of the Aqua Virgo, the aqueduct completed by Agrippa in 19 BC, the baths were supplied with water and became regular thermae, with a large ornamental pool (Stagnum Agrippae) attached. Agrippa furnished his baths with decorations that may have been executed in glazed tiles and with works of art: the Apoxyomenos of Lysippus stood outside. He left the baths to the citizens of Rome at his death, 12 BC. The Baths of Agrippa were damaged by fire in AD 80 (Cassius Dio, lxvi.24), but were restored and enlarged; they were thronged in the times of Martial, and enlarged under Hadrian and later emperors. Sidonius Apollonaris mentions that the Baths of Agrippa were still being used in the fifth century. In the seventh century the structure (no longer in use after the Ostrogoths cut off the Roman aqueducts in the 530s) was being mined for its building materials, but much of the Baths were still standing in the sixteenth century, when the ruins were drawn by Baldassare Peruzzi and Andrea Palladio, among others. 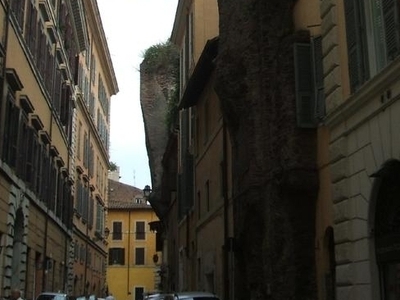 Here's the our members favorite photos of "Ruins in Rome". Upload your photo of Baths of Agrippa!